When Power FC forced Hearts of Oak to a goalless game in Accra of all places last season, the result raised the profile of the Tema club. This afternon when the two sides clash at the El-Wak Stadium in Zone B of the Special League, Power FC have a responsibility to maintain the outstanding performance to underline their status as an emerging force. But although they still boast of some key stars who played in that game in Accra, Power is bereft of the technical services of Coach Ken Augustt who masterminded the draw with Hearts. Hearts also now have Coach Ernst Middendorp on their bench, while Louis Agyemang, Emmanuel Osei Kuffour and Lawrence Adjei form a potent strike force. And that is the nature of the task confronting both sides this afternoon. But the real game will be played at Obuasi where Ashantigold and Asante Kotoko clash in the pick of Zone A matches. Parading a fearsome line-up of Joe Hendricks, Aziz Ansah, Stephen Oduro, Yusif Chibsah, Charles Taylor and Michael Osei, Kotoko have always possessed a squad capable of winning maximum points. But they have always found Obuasi a slippery terrain, and in the presence of Shaibu Yakubu, Awudu Ronaldo and Valentine Atem the champions have a tall order to surmount. At Kumasi King Faisal play Arsenals while Okwawu welcome Bofoakwa to Mpraeso. 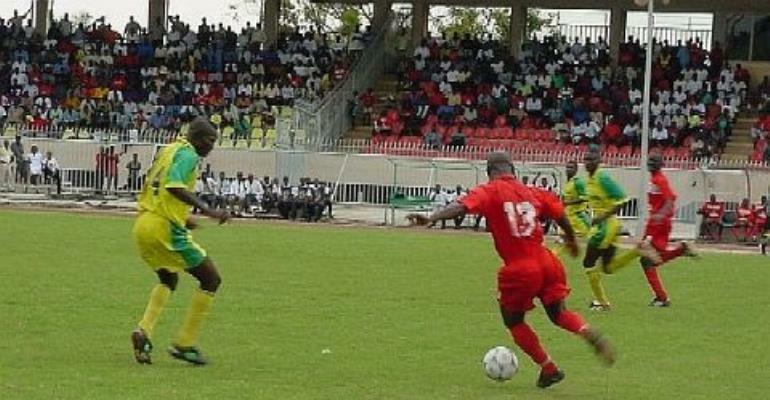 Great Olympics have a difficult date with Feyenoord Academy, while Heart of Lions and Hasaacas meet at Kpando. Liberty Professionals host Real Sportive in Accra tomorrow.